The leader of one of the parties in Brazil's government coalition has resigned from Congress, admitting he received money from the ruling party. 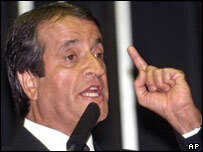 Valdemar Costa Neto, president of the Liberal Party, said he had used the payments to fund an election campaign. He denied that the money was a bribe to encourage his party to support the ruling Workers' Party in Congress. Those claims are at the centre of a corruption scandal rocking President Luiz Inacio Lula da Silva's government. "I announce that I give up my federal deputy's mandate," Mr Costa Neto said. "I acknowledge that I made a mistake when I accepted funds destined for campaigning without the necessary documents that would make the donation official." Having resigned, Mr Costa Neto cannot be impeached by Congress - an eventuality that would prevent him running for public office for a number of years. He said he intended to remain as president of his party. Mr Costa Neto is the first member of Congress to quit over the scandal, though five senior Workers' Party officials have already stepped down, including former cabinet chief Jose Dirceu. Mr Dirceu, former right-hand man of President Luiz Inacio Lula da Silva, is due to testify in Congress on Tuesday. So far Lula's standing has not been badly damaged by the allegations that his party doled out cash to gain support for key votes. The scandal was broken by Congress member Roberto Jefferson in June, when he said colleagues were being paid monthly bribes in exchange for their votes.